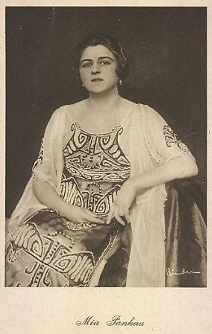 The actress Mia Pankau made her film debut already in 1917 with "Wenn Frauen lieben und hassen" (17) directed by Jaap Speyer, with whom she was married and shot several movies in the next years. The height of her career followed in the 20's. She acted successfully in the productions "Entblätterte Blüten" (20), "Das blonde Verhängnis" (21), "Jimmy, ein Schicksal von Mensch und Tier" (22), "Der allmächtige Dollar" (23), "Elegantes Pack" (35), "Die Moral der Gasse" (25), "Hotelratten" (27) and "Alraune" (27). To her last movies belong "Das verschwundene Testament" (29) and "Tänzerinnen für Süd-Amerika gesucht" (31) - her only talky.